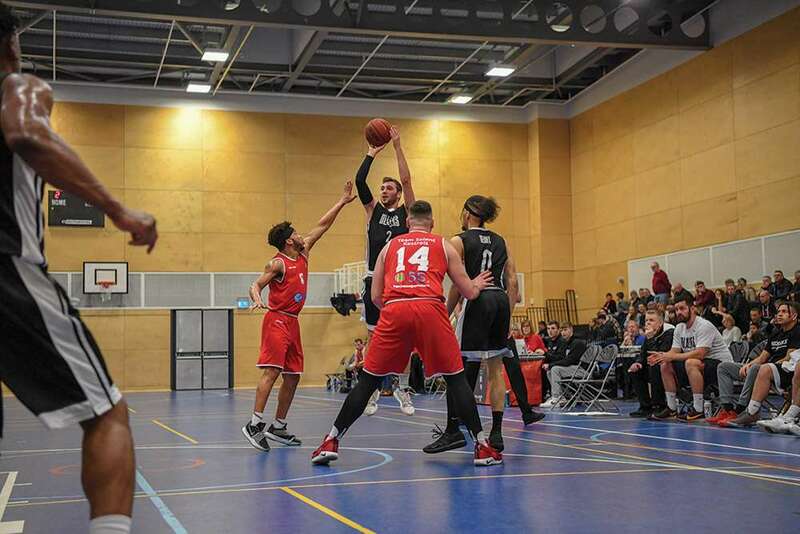 Derby Trailblazers excellent run of form continued at the Clarence Wiggins Sports Centre on Saturday night as they secured an impressive 85-74 home win against the league leaders, Team Solent Kestrels. The Trailblazers dominated the match, leading for all but 59 seconds and enjoying a 23 point advantage at one stage, before the Kestrels produced a barrage of late three-pointers. Malcolm Smith led Derby with 26 points and eight rebounds, while Jake Wesselingh added 14 points. Isa Brandon produced the Trailblazers only double-double, finishing with 13 points, ten rebounds and four blocks. Other notable contributions came from Tre Wilford, who had eleven points and nine rebounds and Kayne King, with nine points and as many assists, while Oli Stanley and Charlie Brown did a great job on the glass, collecting nine and six rebounds respectively. Tight defence was at the heart of Derby’s success, as they took advantage of a limited Solent roster which was clearly missing the contribution of Nick Lewis, who is midway through a lengthy suspension. Travis Charles led the visitor’s efforts with 26 points, while Elliott Dadds added 17 and back court leader Herm Senor II was restricted to half his season’s average, netting just ten points. After opening scores from Smith and Oli Stanley were interspersed with a basket from Charles, Solent took their only lead of the night, as Tayo Oyefusi struck from deep to make it 5-4. It was a lead which they would hold for just eight seconds before Brandon replied with a three-pointer, to kick start a 7-0 burst. An offensive put-back from Brandon made it 15-7, before the Kestrels rallied briefly, with a six straight points, prompting a Derby time-out. Solent briefly tied the scores at 15-all, but three-pointers from Wilford and Wesselingh either side of a basket from Dadds helped restore Derby’s composure. Although the rest of the first quarter remained tight, the Trailblazers were able to take a 23-19 lead into the second period, which Wesselingh began with scores from outside and inside the arc. Further scores from Brandon and Smith saw Solent forced into an early time-out, as they found themselves 32-19 in arrears, but they responded with six straight points from Charles. By half-time, the Trailblazers had doubled their first quarter advantage from four to eight points, leading 40-32, but it was in the third quarter where they would really start to dominate. A basket from Brandon, a steal and score from Wilford and another score from Smith saw the advantage stretched to 46-32 and the Kestrels needed another early time-out, but unlike before the one they took early in the second, this one had little effect. Derby’s lead remained around the ten to fourteen point mark and with baskets from Brandon and Smith interspersed by a Kirkman turnover in the last minute, it meant the Blazers were in dreamland, leading 64-49 as they went into the final break. Matt Ward-Hibbert opened the fourth quarter with a three-pointer, which was followed by a lay-up from Wilford after Solent had turned the ball over twice. Derby’s biggest lead of the match came with 2’50” left as Wesselingh converted his third triple of the game to put the Blazers 81-58 ahead. Solent subsequently used their last time out and although Coach Guymon belated got the response he’d been looking for, but it was ultimately too little and too late. After an offensive put-back from former Derby Academy graduate Sam Turner, they netted a trio of back to back three-pointers, cutting the gap to 81-69 and prompting a time-out from the Blazers. However, they had already done enough to secure the win and a series of free-throws from Ward-Hibbert, Stanley and Brandon made things certain before Dadds converted two of two and finished the game with a three-pointer. “To beat the league leaders in that manner would suggest that was perhaps our best win of the season, but I know there have been times where we’ve played better. I did however think we were excellent defensively until the last three minutes when they hit a few long range shots. “It seemed like we controlled the tempo well and we really tried to focus on taking away their strengths, which worked well for the most part. We also managed to get nine blocked shots from multiple guys which was really impressive. “I also thought our press was effective once again, helping to slow them down, particularly in the third quarter,” he said. Derby: Smith 18, Ward-Hibbert 16, Brandon 15, Ptak 9, Stanley 6, Wilford 4, Wesselingh 3, Bowman 2, King 1, Brown 0, Mutemesango 0. Solent: Charles 26, Dadds 17, Scarlett 10, Senor 10, Brown 4, Oyefusi 3, Kirkman 2, Turner 2.